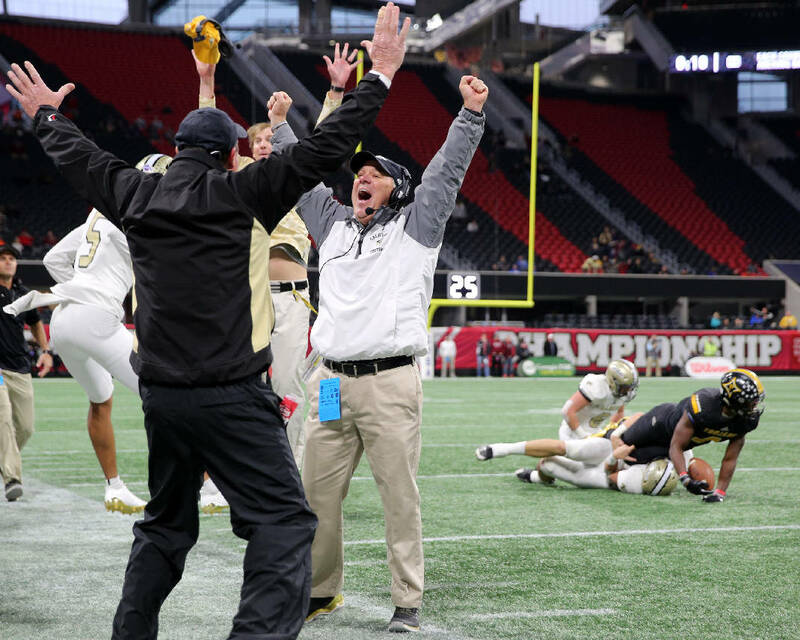 Calhoun football coach Hal Lamb celebrates as his team stops Peach County on its final possession of the Georgia Class AAA state championship game Friday at Mercedes-Benz Stadium in Atlanta. Calhoun won 10-6. ATLANTA — State championship football teams are supposed to be purebreds, the top of the line. Teams that flash elite speed, perfect execution and the size to impose their will. The Calhoun Yellow Jackets are the 2017 GHSA Class AAA state champions after a 10-6 win over Peach County on Friday at Mercedes-Benz Stadium, but they are, by coach Hal Lamb's own admission, much more mutt than blueblood. A team that gains only 158 yards of total offense is not supposed to carry home a championship trophy. Neither is one that commits 10 penalties and commits a turnover inside its own 30 while nursing a precarious lead. But Calhoun (14-1) did, taking the team's season motto of "Find a Way" to the extreme. "Nobody gave us a chance," an emotional Lamb said after a wild and controversial final few minutes. "I love this team. They fight and fight the entire game, and they just find a way. When we got beat by Cartersville early, everybody wrote us off, but here we are state champions and nobody can write these kids off again." Peach County (13-2) lost for the first time since falling 38-35 to Warner Robins in its second game of the season. › Class AAAAA: Rome (14-0) vs. Warner Robins (14-0), ppd. › Class AAAAAA: Coffee (10-3) vs. Lee County (13-1), ppd. › Class A public: Clinch County (11-2) vs. Irwin County (12-1), ppd. › Class AA: Rabun County (14-0) vs. Hapeville Charter (13-1), ppd. › Class AAAA: Marist (14-0) vs. Blessed Trinity (12-2), 4:30 p.m.
› Class AAAAAAA: Colquitt County (11-3) vs. North Gwinnett (13-1), 8 p.m. While Calhoun's offense sputtered to move against a stout and aggressive defense, Calhoun's defense played a game for the ages. Facing a team that had averaged 46 points per game, the Yellow Jackets held them to two Mitchell Fineran fourth-quarter field goals and 170 total yards, including just 9 on the ground. Led by senior linebacker Bailey Lester, Calhoun sacked prolific Peach quarterback Antonio Gilbert four times and intercepted two passes. The first of those produced the game's first points when junior safety Brannon Spector stepped in front of a Gilbert pass just before halftime and returned it 46 yards for a touchdown. "I just wanted to make a play for my team," the elated Spector said afterward. "I was watching his eyes, and as soon as he started to throw it I jumped the route and there it was." The Calhoun special teams helped produce the next score. Lamb elected to pooch the second-half kickoff and the ball went straight to an open spot in the Trojans' return alignment, where Calhoun's Collin Baggett caught the ball one-handed at the Peach 34. The Yellow Jackets managed one first down to the 17, leading to Elmer Gutierrez's 34-yard field goal and a 10-0 lead. They needed it as the offense struggled to put anything together. A myriad of penalties and overthrown passes and the inability to handle Peach linebacker Jaquez Jackson and the Trojans' pressing defensive backs kept Calhoun off balance. After Gutierrez's field goal the Jackets never crossed midfield again. "We didn't play a good game offensively — and you have to give Peach County's defense credit for that — but our defense won this game for us," Lamb said. "The only thing I can compare this defensive effort to is the 2011 win over Buford in the championship game. I mean, to hold this team to six points was just a tremendous effort." Peach finally got the big play it needed on the first play of its first possession in the final quarter, a 41-yard pass from Gilbert to Terkel Jefferson to the Calhoun 31. But the Jackets stiffened. They even appeared to create a turnover before Gilbert was ruled down before fumbling, but Peach's standout kicker, Mitchell Fineran, nailed a 50-yard field goal. Calhoun's Zack Fuller, who led all rushers with 74 yards on 12 carries, was stripped of the ball by a charging Jackson on a first-down play moments later, with Peach's Sergio Allen recovering at the Calhoun 24. Again Calhoun stood its ground, with linebacker Davis Allen corralling Gilbert on a third-down scramble. Peach had to settle for another Fineran field goal to cut the lead to 10-6 with 5:52 remaining. "We had to make the stop there," said Allen, who had a game-high 12 tackles. "We kept the pressure on them all night, and we weren't going to let them score after the turnover." Peach forced a quick three-and-out, taking over at its own 46, and Gilbert passed to Millard Thomas for 19 yards before Trevon Woolfork ripped off his team's biggest rushing gain of the day, 13 yards to the Calhoun 23. A short run was followed by two Gilbert incompletions, setting up a fourth-and-9. Gilbert avoided a rush, stepped up in the pocket and appeared to hit Noah Whittington in stride at the 3. Whittington took a step and stretched the ball out in an effort to score, but as he hit the ground it squirted away. The official quickly ruled the pass incomplete, turning the ball over on downs and sending the Peach sideline into a frenzy as coaches and players pointed to the video scoreboard replay. "I couldn't tell from our side what happened on that play, but I do know they missed two fumble calls," Lamb said. "So, to me, they all evened out." Calhoun, set back by two more penalties, had to punt from its 28, with Peach taking over one last time at its 41 with 1:31 to play. Defensive end Brice Craig sacked Gilbert on first down with a diving tackle and a 17-yard loss. A completion to Jefferson got the lost yards back, but an incompletion was followed by a short pass to Woolfork on fourth down that was stopped well short of first down. Warts and all, the Yellow Jackets started celebrating the school's fourth state championship, the third under Lamb. "I can't say enough about these kids," he said. "Our kids believed they could win and our coaches believed we could win, and, behold, we are state champions. What a run we had in the playoffs. We kept getting better and better each week, and we peaked in the playoffs and that's what it's all about. "Our kids showed a lot of heart and determination, and no one can take this trophy away from us." As Calhoun and Peach County competed for the AAA title — and snow accumulated outside the stadium — the GHSA decided to postpone Friday's remaining state championship games for AAAAA (Rome vs. Warner Robins) and AAAAAA (Coffee vs. Lee County), as well as today's early finals for A public (Clinch County vs. Irwin County) and AA (Rabun County vs. Hapeville Charter). According to a release on ghsa.net, the decision was made after "monitoring worsening weather conditions and consulting with the National Weather Service and Mercedes-Benz Stadium officials." Tickets for those games will be honored when the postponed games are made up, according to the release. On Thursday night, the GHSA posted a release stating that if games were postponed, they would be made up next week at participating schools' home stadiums, with the higher seeds hosting or a coin flip determining the host in case of equal seeds. Today's late finals for AAAA (Marist vs. Blessed Trinity) and AAAAAAA (Colquitt County vs. North Gwinnett) will be played as scheduled.